About 800 children from Holy Family Catholic Academy, Nimitz Elementary School and St. George's Preschool participated yesterday in the Freedom Walk, a commemoration of the Sept. 11, 2001, terrorist attacks. The walk started on the corner of Main and Valkenburgh streets and continued up and down Main Street. 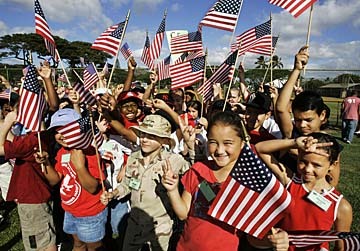 These fourth-graders from Nimitz Elementary proudly waved their American flags. 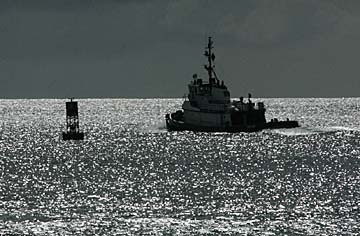 Miki Miki, a tugboat, left Honolulu Harbor yesterday on a sparkling silver sea into the late afternoon sunlight.